For many years, Roland have designed acoustic guitar amps which have been the foundation on which many others then build upon. It goes without saying that the Roland AC-60 stereo combo amp is very difficult to go up against thanks to its innovative construction which uses refined digital signal processing. It features two channels, a guitar input and also a mic / line input as well as a stand to mount the amp, making it a versatile combo amp that is of an exceptional quality compared to its counterparts on the market. Roland have designed the AC-60 acoustic combo amp using the latest in DSP technology which sets it apart and generates a full-bodied, melodic sound. Do not be fooled by its compact size as this amp certainly offers massive projection. The stereo AC-60 is built with 2 x internal 30 watt speakers which offer amazing stereo / multi-band chorus which also has a brand new “wide” mode and a sparkling reverb which has been specifically formed just for the acoustic guitar. For more low-end tones you can activate the AC-60’s Subwoofer output. As mentioned, the Roland AC-60 is a dual channel acoustic amp with one for the Guitar and another for a Mic / Line In and this has a unique feature known as Phantom Power. The Phantom Power setting ensures that the AC-60 is a more than capable and reliable accomplice for any small gig. The guitar channel has a handy button which allows you to switch between either a piezo or a magnetic pickup input, and Roland have also installed an anti-feedback frequency control which works efficiently to completely minimise the possibility of feedback. If you’re looking to tune silently while on stage there is also a convenient mute switch as well as a Stereo Line Out which enables you to connect a mixing desk or PA system. The AC-60 comes with a tilt stand so that it can be mounted in a way that further improves the overall acoustic projection in the room. 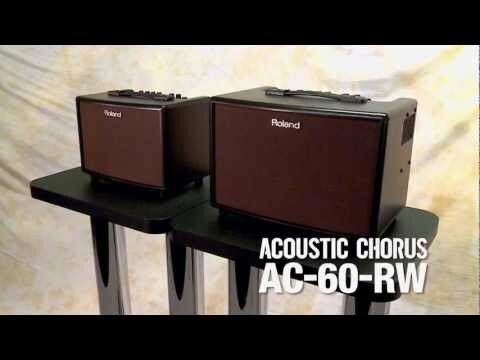 The Roland AC-60 is a superbly built acoustic guitar combo amp which stands out against the rest to make for an incredibly well-built, versatile amplifier.